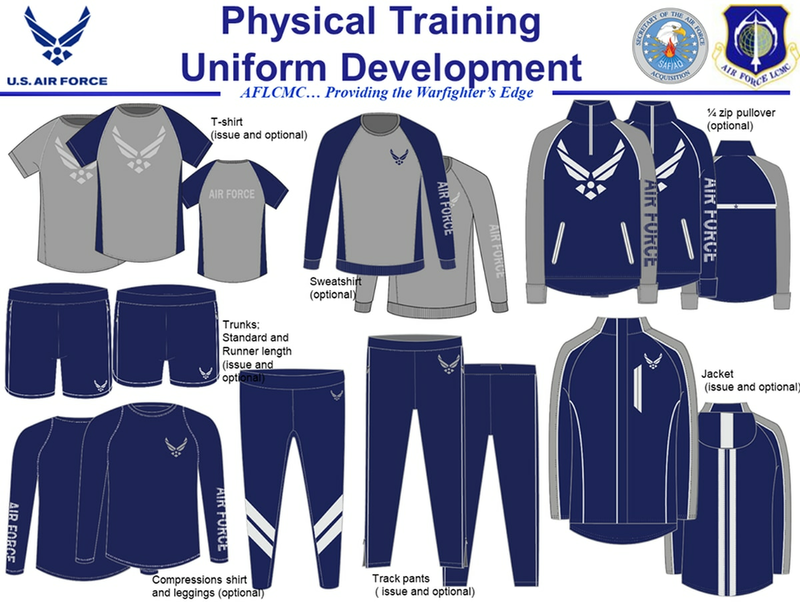 Slides depicting mockups of the possible new physical training uniform now under development surfaced online Tuesday. The Air Force Life Cycle Management Center slides, which were dated Nov. 20 and posted on the unofficial Air Force amn/nco/snco page, show designs for T-shirts, sweatshirts, quarter-zip pullovers, trunks, compression shirt and leggings, track pants, and jackets in which airmen could exercise. Chief Master Sergeant of the Air Force Kaleth Wright said in an August interview that the service was working on a new PT uniform, and was considering making some from a moisture-wicking fabric. That moisture-wicking option would help airmen in warmer environments stay comfortable as they start sweating, Wright said. “We’d like to get back to a little more heritage on the jacket,” Chief Master Sergeant of the Air Force Kaleth Wright said. “It has kind of begun to mirror more of a business suit, more than a military service uniform." Wright also said the Air Force was happy with the blue-and-gray design of the current PT uniform, and was unlikely to make major changes to the design. The images posted on the amn/nco/snco page appear to have some design changes from the current uniform, but adhere to the blue-and-gray color scheme. Wright said the new PT uniform could be rolled out later in 2019, and that it is also designing an updated version of its service dress blues uniform that could hearken back to older designs. In a statement Wednesday, the Air Force said the physical training gear is still being reviewed, but no decisions on possible changes have yet been made.